- What's up bro? Did you hear about that shooting? You guys and your guns, man. It's crazy! I had been excited about this London trip. 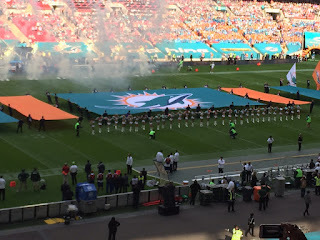 Bro-in-Law and I had planned to go to London to see our Dolphins play against our rival team. It would be history. The first division rivalry game ever played overseas. We would be a part of that. We bought our tickets through the Air Force base in England back in March when I visited my brother. Bro-in-Law has become quite the passionate Dolphins fan. I may have created a monster. The waiting was over. The first three games had been played and the Dolphins weren't playing well (only one victory). London was going to be where we turned it around. This would be exciting! More exciting would be getting to see one of my military brothers. I hadn't seen him in a few years, but he would be there to pick us up when we got there! Bro-in-Law would get to see what that Air Force brotherhood is all about.